Timothy George Thoppil - P3 North America Inc.
Unwinding Electric Motors: Strategic Perspectives and Insights for Automotive Powertrain Applications provides an in-depth assessment of the most important technology, manufacturing, and supply chain aspects of the fast-paced world of electric motors. A joint effort that brings together the technology and product strategy experience of the P3 Group and the focused reach of SAE International, Unwinding Electric Motors: Strategic Perspectives and Insights for Automotive Powertrain Applications lends clarity combined with solid data to those interested in understanding the fundamental factors shaping this industry in the next five years. Authored by Timothy G. Thoppil, from the P3 Group, this market study draws on extensive industry experience and is supported by surveys and interviews with industry professionals from OEMs, Tier 1 suppliers, research institutions, and universities. Unwinding Electric Motors: Strategic Perspectives and Insights for Automotive Powertrain Applications offers reliable market intelligence and discernment to the technical and business professionals in search of valuable input to support good decision making. 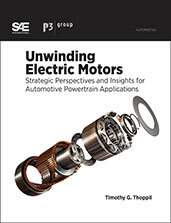 If you do not have access to SAE MOBILUS via username/password or institutional access, you can still purchase the Book, Unwinding Electric Motors: Strategic Perspectives and Insights for Automotive Powertrain Applications.